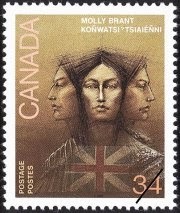 "The Three Faces of Molly Brant" (Iroquois, European, Loyalist). 1986 design, Canada Post commemorative postage stamp. Mary Brant, better known as Molly, was born around 1736, possibly in the Mohawk village of Canajoharie or further west in the Iroquois hunting grounds in Ohio Country. 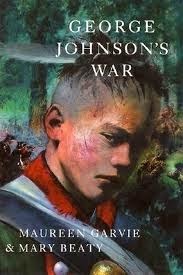 Her parents were Christian Mohawks. Most historians believe that her father was named Peter. Her brother Joseph Brant was born in 1743. In September 1753, Molly's mother married Brant Kanagaradunkwa, a prominent Mohawk sachem of the Turtle clan, and Molly and Joseph took their stepfather's name as a surname. In Canajoharie, the Brants lived in a colonial-style frame house and used many European household goods. The family attended the Church of England. Molly was fluent in Mohawk and English. It is unclear whether she could read and write. Several letters signed "Mary Brant" may have been dictated by her and written by someone else. 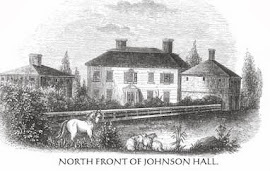 Around 1758 she became was the consort of Sir William Johnson, the influential British superintendent of Indian Affairs, and together they had eight children. After Johnson's death in 1774, Molly and her children returned to her native village of Canajoharie across the Mohawk River. As the American Revolutionary War intensified, she fled to Canada, where she worked as an intermediary between British officials and the Iroquois warriors. After the war, Molly settled with several of her children and their families in what is now Kingston, Ontario. For her service to the Crown, the British government granted her a pension and compensated her with land and money for her wartime losses.